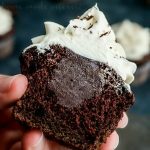 These decadent Triple Chocolate Cupcakes are filled with a creamy chocolate ganache and topped with a luscious white chocolate frosting. In a large mixing bowl combine boxed cake mix, chocolate pudding mix, sour cream, vegetable oil, and eggs. Prepare a muffin pan by inserting a cupcake liner in each cup. Once combined pour the chocolate cupcake batter into the cupcake liners filling about 2/3 full. Bake for 20 - 25 minutes until you can insert a toothpick and it comes out clean. Remove cupcakes from oven and let them cool completely. Once cooled cut a small core from the center of each cupcake. In microwave heat heavy cream until boiling. Pour heavy cream over dark chocolate and stir together until chocolate is fully melted. Pour dark chocolate ganache into each cupcake. Let ganache cool inside cupcakes until you are ready to frost. Pour heavy cream over white chocolate and stir together until chocolate is fully melted. Let white chocolate cool for 5 minutes. In a large mixing bowl cream together butter and powdered sugar until light and fluffy. While continuing to mix butter and sugar slowly pour in white chocolate. Whip until fully incorporated and light and fluffy. Pipe frosting onto filled cupcakes.